Community Business Incubator, Inc., (CBI) a nonprofit 501(c)(3) presents their Spring Jazz Benefit Concert. An evening of live music to support their project based entrepreneurial training programs for disadvantaged and under-served youth. 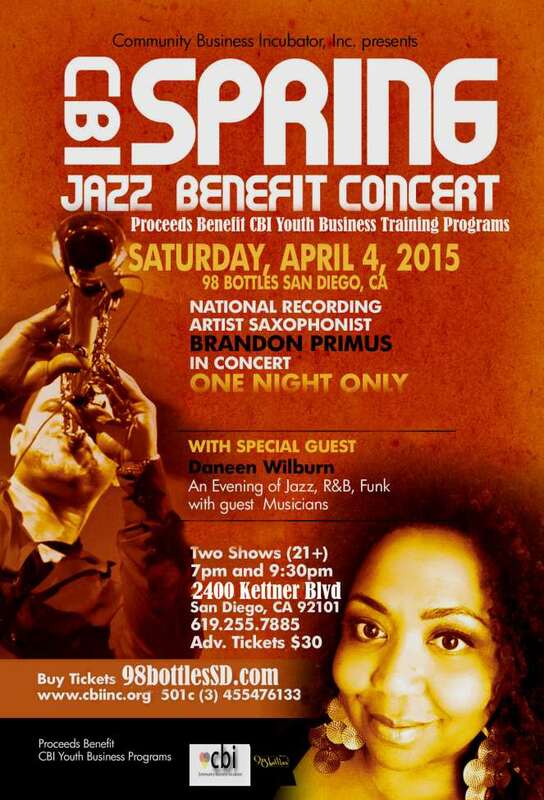 SAN DIEGO - Feb. 7, 2015 - PRLog -- Get your jazz on and kick off Jazz Appreciation Month with Saxophonist Brandon Primus at the CBI Spring Jazz Benefit Concert. Stephen Walters Founder & President of Community Business Incubator (CBI) and their Board of Directors cordially invite you to their Spring Jazz Benefit Concert on Saturday, April 4, 2015 in San Diego, CA starting at 7:00 PM. It is an evening filled with jazz, blues, gospel with proceeds benefiting CBI's youth business programs. An intimate live music fundraiser opens to the public with Award Winning and National Recording Saxophone Artist Brandon Primus and featuring the incredible Lady of Song Daneen Wilburn. These two artists have SOLD OUT all of their 2014 concerts. The show is set to fill the room with high energy, hand clapping, and a foot stomping good time. If you love this type of music, you do not want to miss this event. Seating will be limited and these artists sell out quickly so purchase your tickets early. CBI is excited to hold this event in The Back Room of 98 Bottles located in the historic section of Little Italy in San Diego, CA. In addition to the extraordinary live music, guests can enjoy a selection of fine wine, craft beers, and food available for purchase. 98 Bottles is located at 2400 Kettner Blvd. #110 San Diego, CA 92101 619.255.7885. There are two show times at 7:00 PM and 9:30 PM. Doors open at 6:00 PM and tickets are $30.00 per ticket. About CBI - Community Business Incubator, Inc: Headquartered in San Diego, California. Created as a charitable and educational organization CBI is a registered 501(c)(3) Non-profit Business Development Corporation, whose core mission is to provide a project based entrepreneurial training program for disadvantaged and under-served youth and business start-ups. $10 food/drink minimum required 21+ events. : Community Business Incuabtor, Inc.